Former Liverpool legend Graeme Souness believes the Reds will have the firepower to halt Real Madrid's quest for a 13th European crown if they negotiate tonight's trip to Rome safely. Jurgen Klopp's side go into tonight's game at the Stadio Olimpico with a 5-2 lead from the first leg at Anfield and are overwhelming favourites to advance. Should the Reds qualify, they will face a Real Madrid side who scraped through last night after a 2-2 saw them defeat Bayern Munich 4-3 on aggregate despite extended periods of sustained pressure on Keylor Navas' goal at the Bernabeu. 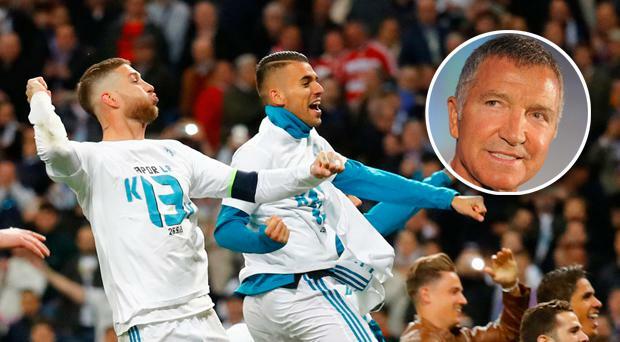 Despite the scare Madrid donned celebratory white t-shits after the game with the message 'to the 13th', a decision criticised by Souness on TV3 last night. "They shouldn't be doing that. That's tempting providence," he said. "I think they have ridden their luck in the last two games against Juve and Bayern. "As I said before the game, this is not the Real we have seen over the past couple of years. "The goalkeeper looks shakier than he has ever done, to the two full-backs not being very good defensively, Ronaldo, who has been the major influence at that club for a decade and he doesn't have that same influence anymore. "They got away with it tonight." Real Madrid have already got no 13 shirts printed. I think that is awesome they are underestimated us so much. Thinking they have it won. Souness is confident that Liverpool's attacking trio of Mohamed Salah, Roberto Firmino and Sadio Mane can capitalise on Real's defensive frailties and is glad that the Spaniards triumphed over the Bundesliga champions. "I think they are tailor-made for Liverpool if they get there," he added. "I'd much prefer them playing Real than Bayern Munich. "I think they are easier to play against. Bayern got up against the back four every time they went up the pitch really. They got through the midfield which is not very good. Kroos never took part in the game, Modric never took part in the game, Kovacic never took part in the game, Casemiro gives them a bit of solidity when he plays. "I think the front three of Liverpool will do a lot better. "Liverpool would get to that team time and time again and with their front three, they would put them away."